Phnom Penh (VNA) – The opposition Cambodia National Rescue Party (CNRP) has called on the European Union (EU) to mediate in the political tensions between CNRP and the ruling Cambodia People’s Party (CPP). 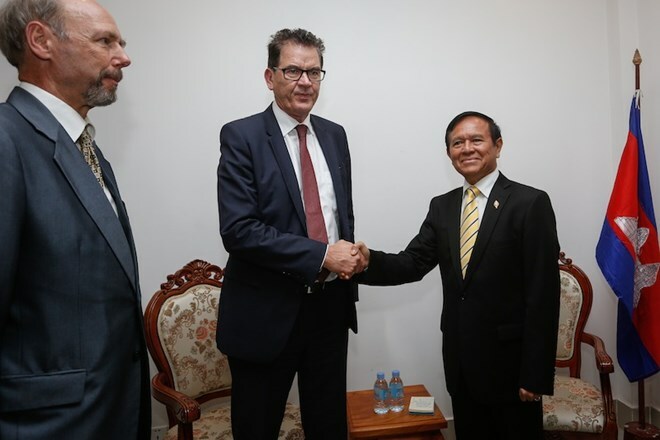 German Minister of Economic Cooperation and Development Gerd Muller, who visited Cambodia from June 14-15, agreed to convey the CNRP’s request to the EU, CNRP spokesman Yim Sovann said. CNRP acting president and lawmaker Kem Sokha is wanted for questioning by the court for his involvement in a lawsuit launched by a woman believed to be his mistress. He has twice refused to appear in court and is now hiding at the CNRP headquarters after the police tried to arrest him in late May. Several opposition lawmakers, members and supports have also been arrested in recent months and the CNRP has reacted by boycotting the parliament. During his trip to Cambodia , Minister Muller had bilateral meetings with Cambodian Prime Minister Hun Sen, Acting President of the CNRP Kem Sokha, and Vice Chairman of the Council for the Development of Cambodia (CDC) Chin Bun Sean.